Richie Porte, a team-mate of Tour de France leader Chris Froome, claims he was punched during this year's race as spectators rounded on Team Sky. The Australian says he was struck during stage 10 on Tuesday as Froome won to take a lead of two minutes 52 seconds, an advantage which remains. Froome, the 2013 winner, has been under scrutiny due to his superiority and has had to deny claims of cheating. "I was [punched] in the last 3km. I got a full-on punch," Porte, 30, said. "It was the same atmosphere on Alpe d'Huez two years ago." Britain's Froome currently leads second-placed Tejay van Garderen after 13 of 21 stages. After he eked out a lead with a stunning performance on Tuesday, he insisted he was a "clean rider" but said he understood why there were doubts because of the history of the sport. Former Tour de France winner Lance Armstrong was stripped of seven titles after he admitted doping. Porte told The Telegraph Cycling Podcast: "They are so anti-whatever we are. Do I deserve to be booed? Does Chris Froome deserve all this? I don't think so. Why doesn't Britain like Chris Froome? Porte approached spectators earlier this week after being abused. 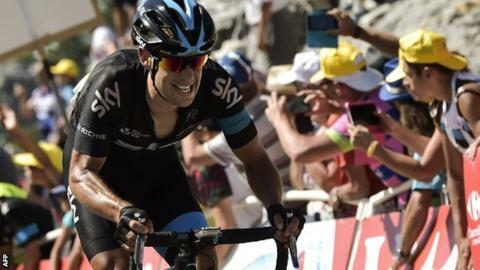 "It's a disgrace they say the same thing to Chris Froome," Porte added. "Just because this team has got its act together. "We do everything right. Look at the Tour we are having. You can't question that we are getting stuck in for Froomey. "Seven of us at the bottom for him. No other team had that. It's because we are organised and committed." Despite claims made about Team Sky, Porte said Froome has a relaxed attitude. Porte said: "When they were giving him abuse I heard him laugh about it. He's got a thick skin and you need that in the yellow jersey."